"With his strong family theatrical background, becoming a dancer, training and performing as an actor with the great Sarah Bernhardt and winning an award as a singer at the Paris Conservatoire, Charles Friant occupied a special place in a long line of French tenors active in the first half of the 20th century. He not only moved extraordinarily well on stage, portraying a role with histrionic subtlety but, more importantly, sang with great taste, style and musicality. His many talents were both natural and also the result of training and, although not unique, it seems rare today to find all these gifts apparent in one tenor. He was without doubt a truly fine and important French artist." "Charles Friant, who was born in the Montmartre district of Paris on 12 January, 1890. He revealed considerable gifts as an actor and was accepted at the Paris Conservatory in the class of the great Sarah Bernhardt. In 1908 and 1909 he participated as an actor on Bernhardt's tours in, among other countries, Germany, Austria, Poland, Russia, Hungary, Italy and Egypt. In Paris he played opposite her in Edmond Rostand's L'AIGLON. About this time it was discovered that he had a tenor voice and in 1910 he again attended the Paris Conservatory, but this time in the realm of music, and he became a student of the noted French baritone, Léon Melchissedec. He debuted in the season of 1918-19, when his name was placed on the roster of the Grand Théatre of Grenoble, where he sang in MANON, WERTHER, CARMEN, TOSCA, LAKMÉ, LA BOHEME, MIREILLE and FAUST. In 1919 Kousnezoff and Friant starred in the world premiere of TARASS-BOULBA, an opera by Marcel Samuel-Rousseau. Albert Carré and the Isola brothers, Directors of the Opéra-Comique, were well aware of Friant's talents and engaged him for their theater. He made his debut as Werther on 4 February, 1920, with Alice Raveau as Charlotte and Daniel Vigneau as Albert. But the role that combined all of Friant's talents and of which he was the greatest interpreter in France between the two wars was that of Jean in Massenet's miracle LE JONGLEUR DE NOTRE-DAME, for it drew upon his grace and agility as a dancer, his presence as an actor and his musical instincts as a singer. His first performance occurred at the Opéra-Comique on 10 June, 1922, in a revival of the work. Lucien Fugère, the doyen of the Opéra-Comique, resumed his magnificent interpretation of Boniface. Friant remained at the Opéra-Comique from 1920 until 1939. At the Monte Carlo Opera, Friant sang for several seasons. On 2 February, 1946, he appeared for his last performance at the Monte Carlo Opera, in the supporting role of Le Dancaire in CARMEN with Juyol and Luccioni in the leading parts. A little over a year later on 22 April 1947, he died in Paris. 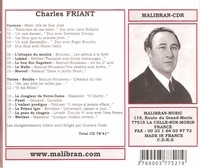 Friant cut a large number of records; he made acoustical discs for Pathé and the Compagnie Française du Gramophone, and electrical recordings for Odéon. He made a number of sides from some of the roles he created, as in LE HULLA, LE BON ROI DAGOBERT, and LA PEAU DE CHAGRIN, which makes them of considerable historical interest. These recordings as well as his interpretations of the more common arias reveal the intensity of his performances. Vocally, the top of his range was not produced with ease, and sometimes it was forced, but his articulation, his musical sensibility, and his sense of phrasing are always evident. His dramatic sense of reality made the characters he portrayed unforgettable."